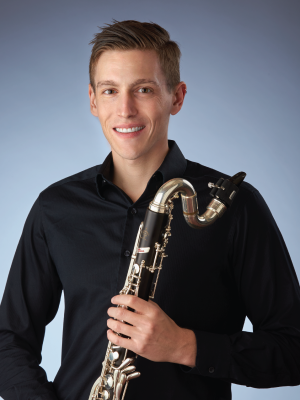 Samuel Rothstein was appointed as the assistant principal and bass clarinetist of the Indianapolis Symphony Orchestra beginning at the start of the 2015-16 season. He received his bachelor’s degree in music performance from Northwestern University where he studied with J. Lawrie Bloom and Steve Cohen. Prior to joining the Indianapolis Symphony, Mr. Rothstein was a member of the Richmond Symphony in Richmond, Virginia, and the Civic Orchestra of Chicago. He has performed with the Chicago, Milwaukee, Virginia, New World, and Illinois Symphony Orchestras as well as the Fort Wayne Philharmonic. Additionally, he was the clarinet player for the 25th anniversary national touring company of Les Miserables, and has also performed in the orchestra of other various productions for Broadway Chicago. Summer festival appearances include the National Repertory Orchestra, Spoleto Festival USA, and the Tanglewood Music Center. After two summers as a fellow at the Tanglewood Music Center, Samuel was invited to return for a third summer as a member of the New Fromm Players, focusing on the study and performance of contemporary music.